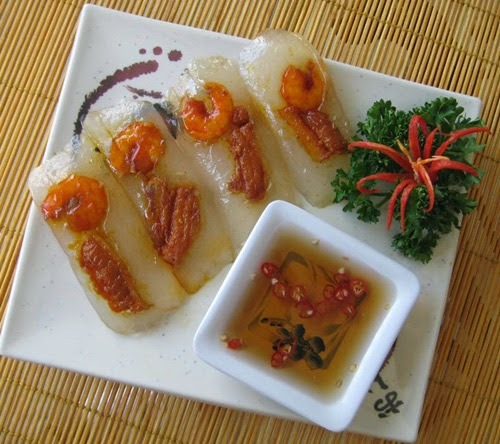 Shrimp and Pork Dumplings (Banh Bot Loc) is one of amazing Vietnamese Food Recipes. It came from Hue city. However, it becomes more popular now. This cake is covered in banana leaves. 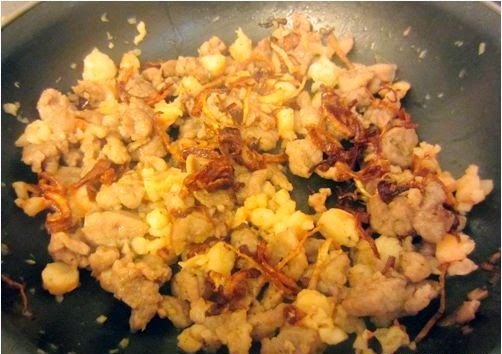 It stuffing is shrimps and braised pork. Using with chili sauce will bring a stunning flavor in your mouth. 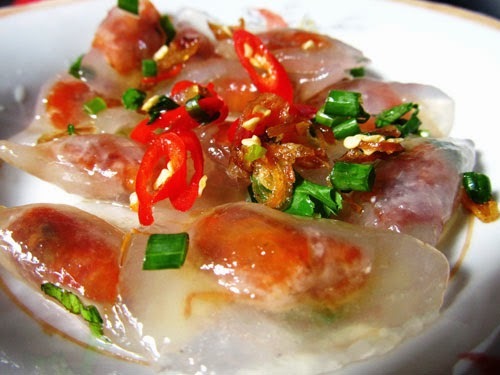 Do not miss this dish when you have a chance to visit my country, especially in Hue City. Today, I will give you the recipe to make one of most delicious Vietnamese Food recipes, shrimp and pork dumplings. Please follow carefully these ingredients below. You need spend about 1 – 2 hours to finish it. 1 tsp pepper, Spring Onion (Use the white part), 1 clove of garlic, banana leaves, annatto oil. Step 1: Pour Tapioca Starch into bowl, add a little sat. Next, pour slowly 125ml cold water into pot and stir frequently. Step 2: Boil 250ml water, and then pour slowly into Tapioca Starch above, stir frequently at the same time. This step is really important to create one of stunning Vietnamese Food recipes. If you pour hot water and do not stir at the same time, the mixture will be curdled. Next, you leave tapioca starch for 1 night. Step 3: Next day, put tapioca starch into small pot, and put this pot inside a bigger pot with water. Cooking about 10 – 15 minutes with medium heat. (Do not stop stirring if you do not want your mixture getting curdle). 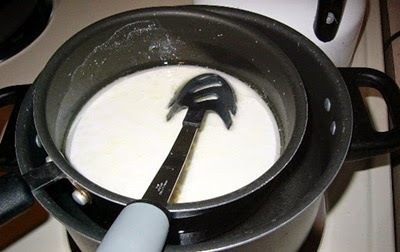 Stir until the tapioca mixture becomes more firm, turn off the heat. Step 4: Clean shrimp and pork in water with a little salt. Do not peel off the cover of shrimps. 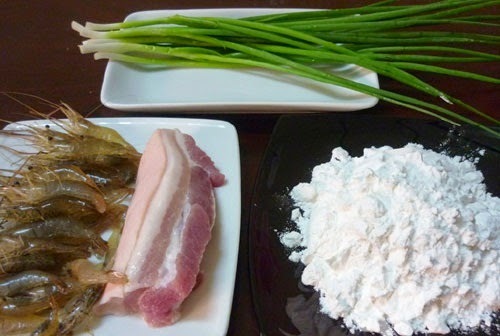 Slice pork and marinate with fish sauce, sugar, pepper, sliced spring onion (white part) and minced garlic. Wait for 1 hour. Step 5: Boil olive oil, add pork, shrimp, sliced spring onion (white part) and a little annatto oil into pan. Cook about 5 minutes, then turn off the heat and pour into plate. 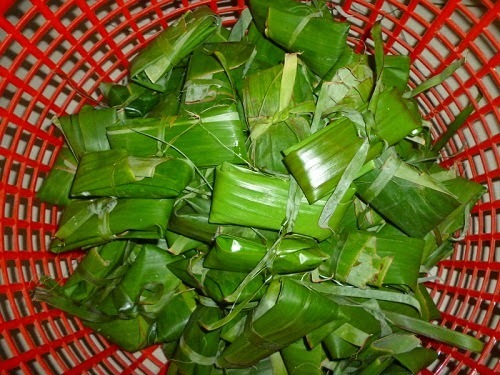 Step 6: Clean banana leaves, cut into medium leaves, sweep a little oil on the face of banana leaves. Scoop each spoon tapioca mixture and spread on face of each banana leave. Then, add more shrimp and pork. Next cover and cluster it carefully. (You can see how to roll through step 4, Vietnamese Spring Rolls recipe). Step 7: Steam Dumplings about 20 minutes. Now, finally, you finish one of amazing Vietnamese Food recipes. It is easy, right? This dish is a perfect breakfast for your family. If you have family, I bet your kids will love it. Using with dipping fish sauce will bring you a stunning flavor and feel comfortable before starring a new day. Good Luck for your cooking.